(TibetanReview.net, Oct08, 2016) – Hundreds of Chinese officials from Tibet Autonomous Region and other Tibetan territories under Chinese rule had arrived at the famed Larung Gar Buddhist Institute in Serta (Chinese: Seda) County of Sichuan Province to identify and send home by force student monks and nuns ordered out by Beijing, reported the Tibetan Service of Radio Free Asia (Washington) Oct 6. China is allowing only monks and nuns belonging mainly to the local area to remain at the institute which otherwise had students from not only throughout Tibet but also from China and other countries. 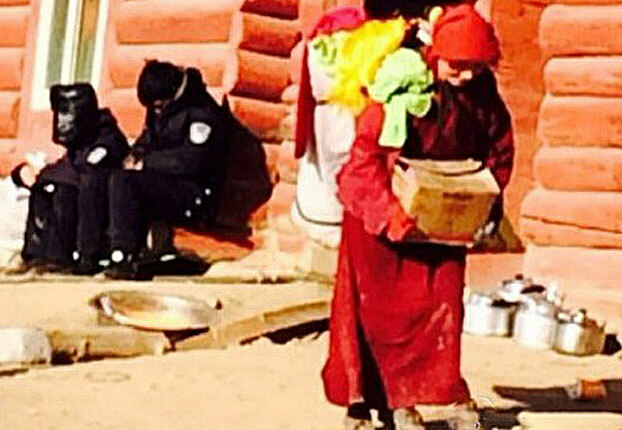 The over 300 government officials from provinces, prefectures, and counties, many of them from Tibetan-populated areas outside Sichuan, were reported to be busily going door-to-door to identify monks and nuns to be removed from the institute and sent back home. And as request by the institute’s senior teachers and abbots, the monks and nuns were reported to be cooperating with the investigations without displaying anger or irritation. Under orders from Beijing, China began demolishing residences of student monks and nuns at the sprawling complex on Jul 20, pulling down 550 of them by Sep 23, with the target being 1,000 demolitions by the end of this year. The idea is to halve the monastic student population at a maximum of 5,000 by Sep 30 next year. The institute was founded in 1980 by the late religious teacher Khenpo Jigme Phuntsok and is one of the world’s largest and most important centres for the study of Tibetan Buddhism.